This week’s sMARt tip is all about the centerpiece! Now that I have teamed up with 1-800Flowers.com in their movement to bring back the centerpiece, I was motivated and inspired to create fun projects that use the traditional pumpkin as something decorative, fresh and new. Tapered Candleholder: A flatter pumpkin works best as a candelabra; into the top, simply cut openings in which to insert the tapered candles. A paring knife is usually the easiest way — simply insert at a 90-degree angle and twist in circles until you have a hole about 1/4 of an inch deep. (In the photo you see one taper, but add as many as you like — between 2-7 looks best.) I prefer a truly flat pumpkin, as they stay in place more easily and don’t obstruct the view across the table. Try the Cinderella pumpkin — an heirloom variety from France — readily available everywhere in various sizes and colors. Choose one the right size for your table combining decor and candles for a one-two punch. Votive Candleholder: Cut a hole in the top of the small mini pumpkin, saving the top as the decorative accent. Squeeze in a votive candle. To add the pumpkin top as decoration: use half of a toothpick; insert it into the underside of the top, then secure it to the outside of the pumpkin at a slight angle. Topiary Tower: Stacking pumpkins is an easy and fun project because by adjusting, moving and turning them you can discover the best way to fit them together like a puzzle. Alternate colors and textures a much as possible. Once you have decided on your tower’s order, it’s a good idea to secure them in place. To do this, skewer them vertically on thin dowelling — cut shorter than the stack — or simply use leftover chopsticks from home delivery to connect each layer. 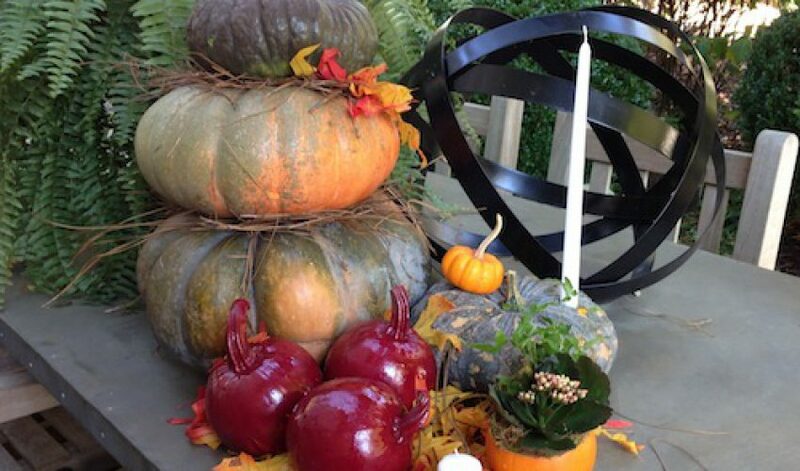 Hay or autumn leaves inserted between each pumpkin adds that final festive touch. This looks great on a buffet or a front porch, too. Candy Pumpkin Apple: All it takes is a little spray paint and some imagination to turn the average small orange pumpkin into a larger-than-life candy apple treat for festive decor. I love using them in multiples to line the center of a longer table. Place these faux apples on a base of fall leaves and you are ready for your guests. For a chic, modern table, try glossy black or silver spray paint instead. After dinner, use them outdoors as they last well and the paint helps deter critters from munching on them. Pumpkin Planter: Designing your own table bouquet can be rewarding and fun. This project is easy and is perfect on the table for a special dinner celebration, to take as a hostess gift, or as the perfect favor for guests after a festive meal. Simply carve out the center of your pumpkin, creating the perfect vessel for placing a plant inside — pot and all. Are you inspired? Then jump into the movement to bring back the centerpiece with any one of these fun ideas! I’d love to hear how you incorporated pumpkins differently — let me know on Pinterest, Facebook, and Twitter.